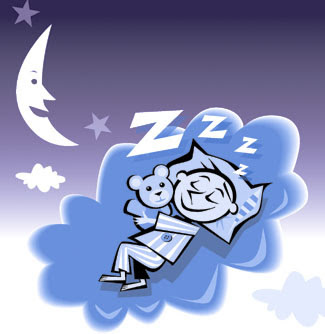 Weighty Matters: To sleep, perchance to dream (of weight loss). New research on why sleep's crucial. To sleep, perchance to dream (of weight loss). New research on why sleep's crucial. Sleep deprivation and obesity are unquestionably linked yet the exact mechanism by which lack of sleep leads to weight gain is unknown. A recent study presented at the Obesity Society's annual scientific assembly may help shed some light. Any Darukhanavala and colleagues from the University of Chicago designed a small but elegant study. They took 10 overweight volunteers whose pre-study average sleep was 7.7 hours nightly and enrolled them in a two week crossover study whereby for each 2 week period they received 8.5 or 5.5 hours of nightly sleep while all were consuming low calorie diets. Physical activity levels in the groups were identical regardless of hours slept. While there was no difference in absolute weight loss in this short time period what was striking was the difference in where weight was lost in the two groups. During the weeks with greater sleep 50% of weight loss (as evaluated by DXA absorptiometry) came from fat and 50% from lean tissue (muscle) whereas during periods of less sleep only 25% was lost from fat with 75% coming from lean tissue. Also striking was hunger which was markedly increased in the short sleep arm of the study. Certainly if these results were applicable to the population as a whole, especially during weight loss efforts, those folks trying to lose weight and sleeping poorly may be losing disproportionate amounts of lean tissue which in turn will disproportionately lower their resting energy expenditure (metabolism) and simultaneously increase their hunger which ultimately may lead them to abandon the effort but not without first losing enough lean tissue to allow them to not only regain the weight they've lost but potentially more. See calories on menus - eat more at home?! The sordid end of the Pixar lamp!